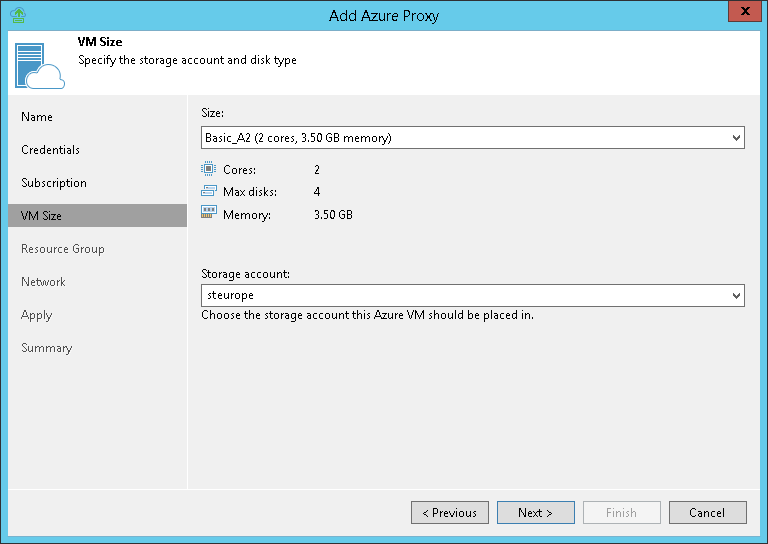 At the VM size step of the wizard, you can select the size for the Azure proxy VM and specify what storage account you want to use to deploy the Azure proxy VM. By default, Veeam Backup & Replication selects Basic_A2. This size is typically sufficient to transport VM disks data to blob storage. If necessary, you can select a greater size for the Azure proxy. If you select a premium storage account, make sure that the VM size is compatible with the selected account. The list of storage accounts will contain only general purpose storage accounts. Blob storage accounts will not be displayed in the list of subscriptions. For more information about account types, see https://azure.microsoft.com/en-us/documentation/articles/storage-create-storage-account/.